Ohio gave the envoys a mixed reception. Sara was back in her old stomping grounds, actually; she’d been born in Cincinnati (though she’d grown up in Detroit) and had lived with her first husband in Cleveland from 1903-1910. It was in Cleveland that Sara had become a Socialist and met Clarence Darrow, who encouraged her free thinking and later introduced her to Erskine. She had done a lot of growing and changing in Cleveland, but the church where her husband ministered had fired her husband for trying to apply Christian principles to those less fortunate, so I wonder how she felt as they rolled through the farm fields an into the city. By the time they reached Cleveland they’d already been to Dayton, Columbus, and Toledo, where they’d gotten good support. 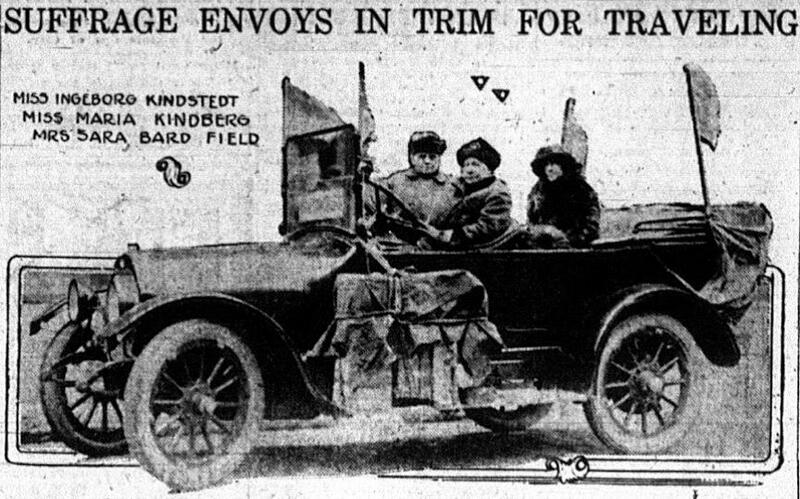 Each city had delivered a number of enthusiastic women who escorted the slightly battered little black car and its weary occupants to the rally location where speeches were made, the women and other important people signed the petition, and then they were whisked off to a reception or dinner. The Governor signed the petition in Columbus, and I’m pretty sure the mayors of Dayton and Toledo did as well, but in Cleveland Mayor Baker refused. He didn’t like the word “Demand” in the petition. Darn. I think he found it a bit uppity. Turns out he wasn’t alone. In Ohio, Harriet Taylor Upton had pretty much had a lock on the Ohio Woman Suffrage Association since 1899. 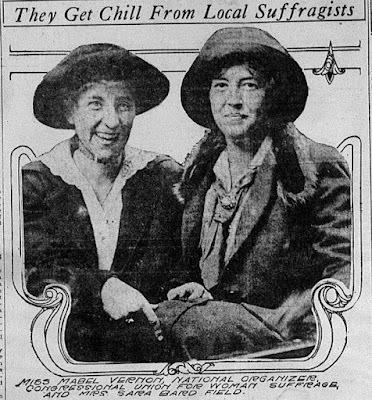 From 1903 to 1910, the same years Sara had lived in Cleveland, she’d also served as treasurer for the National American Woman Suffrage Association (NAWSA.) NAWSA was the more conservative “legacy” suffrage organization that loathed the CU’s “We Demand” approach. The CU’s Ohio president Mrs. Cyrus Mead came up from Dayton, and Mrs. Louis A. Dickinson form Fremont had personally appealed to OWSA’s governing board to encourage them to support the envoys, but they haughtily refused. “The Woman Suffrage party does not indorse the antiparty policy of the Congressional Union,” they announced. “Woman suffrage is a basic principle of human rights and not a political offshoot.” Mrs. Mead pointed out that they were “working toward a common end, namely, votes for women, and there should be no friction.” We all want the federal amendment, so they should all just work together, she told a reporter. 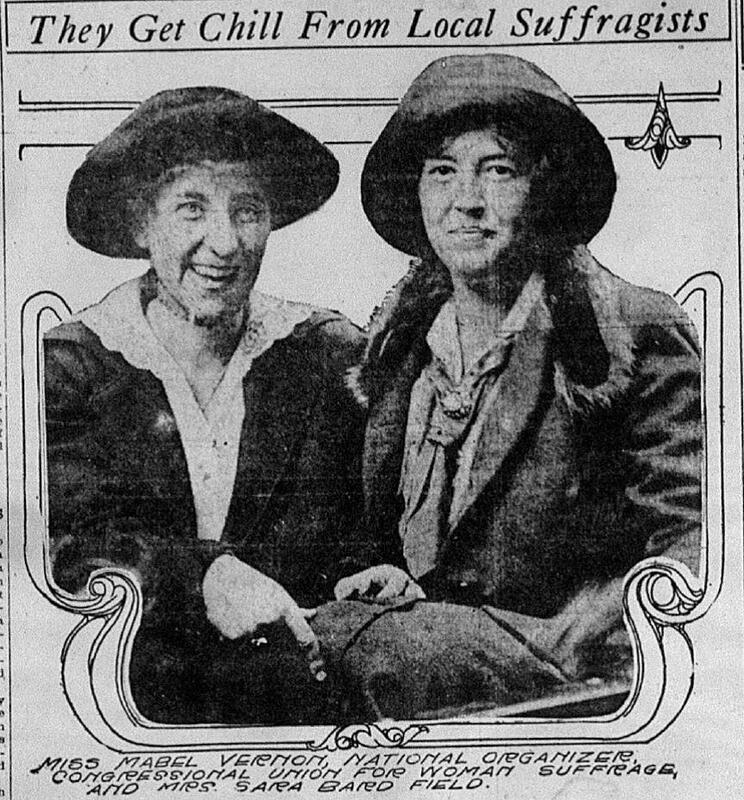 But OWSA would have none of it, though other more daring women did show up to the event, along with a congressman or two. And since the other cities had been supportive Ohio wasn’t a total loss. So they said their farewells, loaded the car onto a boat, and headed off to Buffalo. Rick and I had a great time in Ohio. We got to see a lot of the state, stayed in two nice AirBnBs, and stayed two nights with my sister Elizabeth and her husband Jim. In Dayton LWV Executive Director Susan Hesselgesser organized a luncheon at the historic Dayton Women’s Club, which has served as a center for social, civic and literary activities since 1916. How cool for women to have their own space, which included a restaurant and a ballroom! I talked some about the original trip and my project, and asked about what’s happening with women in Ohio. Governor Kasich, of course, is running for President and is trying to appear more moderate. So he expanded Medicaid under the ACA, but he (along with a majority of the legislature) is vehemently anti-abortion. Half of Ohio’s abortion clinics have closed in the last four years and the forced birthers keep looking for ways to make it harder for women to get this help. I also heard a lot of the same complaints that I’d heard in other Republican-led states; their efforts to suppress voting, and to gerrymander districts to ensure they retain and strengthen their political power. A new bill the LWV is helping to champion will make the redistricting process fairer. While the last two issues affect men as well as women, there’s no doubt that women’s interests are better protected when they can vote and when districts are drawn in such a way that women and minorities can vote and get elected. One woman told me she’d been working on women’s rights issues for 46 years and had helped organized demonstrations in the 1970s. I was really moved thinking about those years of dedication, and thanker her for her service. The LWV president in Toledo, Ann Fabiszak Payne, hosted a reception for me at her house, where we had another great discussion. This was another group of really smart women who have worked for decades to help protect against threats to our civil rights. We owe them a huge vote of thanks! I messed up the scheduling so I wasn’t able to meet with the Cleveland LWV but hope to in a future visit. Since my sister lives there I now have multiple reasons to go back. Elizabeth and Jim had arranged for Rick and me to visit the Crawford Auto Aviation Collection of the Western Reserve Historical Society and meet Derek Moore, the Curator of Transportation History. Derek was a wealth of information about vintage cars (as you might expect from his title) so he was able to answer all the questions we’d been saving up over the last 5 weeks. 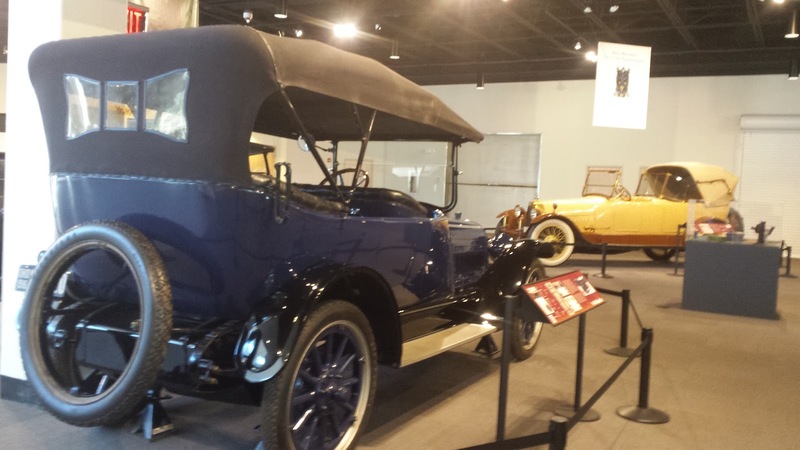 The Museum doesn’t have an Overland Six but had a 1916 Chandler which was pretty similar, so we took a look at that. Derek has put the word out through his contracts that I'm looking for a restored Overland Six to look at, and he also wondered if it might be possible to find the original car Maria and Ingeborg bought. Wouldn't that be amazing? 1) The top would roll up and fasten to the sides of the car. There were plastic windows that could be fitted in as well. While they helped some they were not dustproof or rainproof. 2) Derek conformed that the car and top weren’t insulated- he was impressed that they made the trip in fall/late fall. 3) The car could run at its top speed with the top up. 4) Top speed was likely 45-50 on good roads. That would really be pushing it, and there weren’t that many good roads, so mostly it would have been quite a bit slower. 5) The earliest cars ran on white gas. 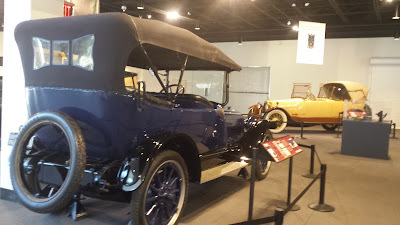 Around 1915 they were starting to make a higher octane gas for cars, but he guessed that this wouldn’t have made it out to rural areas, especially in the western states. Once the car got hot it could burn almost any type of gas. 6) Early cars had a place on the running board for three types of cans. There was a red can for gas, a green can for oil, and blue can for water; that’s how they carried their spare fluids. They would have topped up water, gas, oil, and transmission fluids at rest stops. 7) The tires then were more like bike tires. There was a tube inside, and they carried replacement tubes and patch kits. It sounded like patching the tube was fussy work; the surfaces had to be clean to make the patch work which must have been hard in the desert sands. The tire itself could handle punctures since that’s not what held the air. 8) Headlights were adequate to drive at night, especially since they weren’t going fast. 9) Cars were reasonably comfortable, but the roads were bad so he confirmed that they were jounced around a lot. 10) The cars were all mechanical (as opposed to computerized) and things like the brakes required frequent mechanical adjustments which would have required Ingeborg to go under the car. While in Cleveland I also met with about 15 students and a smattering of teachers at the Hawken Middle School, where the school has a feminist club called “We for She” which includes both girls and boys; I think the founding inspiration for the Hawken club came from student Lucy Watson and a young teacher named Judy Merzbach. I hadn’t realized this before this trip, but these feminist clubs are kind of a thing and are springing up in schools around the country, which makes me very happy. Anyway, we had about 20-30 minutes or so to talk about this over lunch. They asked a lot of sharp questions and I really enjoyed talking with the younger set about this history! Sara Bard Field, Poet and Suffragist, an Interview Conducted by Amelia R. Fry, Suffragists Oral History Project, University of California.